We’ve found a new favourite board game and Mr 8 needed some tips so here are my simple strategies for Sequence. I grew up playing board games and it is something that I encourage my kids to play too. I’ve mentioned before some of our favourites – 5 Board Games We Love – but a new one came into our household a couple of weeks ago and I think we’ve found a new favourite! 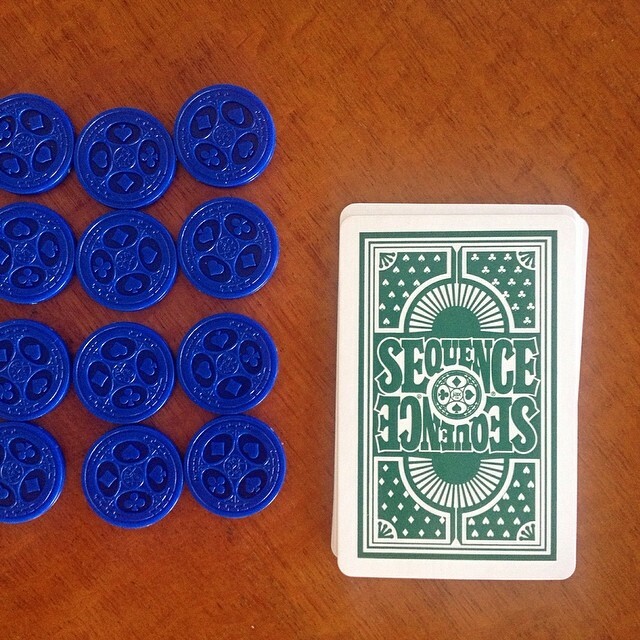 Sequence is a game of strategy where players have to make lines of 5 tokens on the game board by matching their tokens to their playing cards. I had not come across this game before so it was fun for us all to learn the rules together. But after a lazy Sunday of playing it a dozen or so times, I realised that even though it was a new game, my husband and I as adults had a distinct advantage over the kids. We had played card games and games of strategy before so we naturally used certain strategies as we played without really even thinking about it. Mr Happy, who is almost 8, was getting particularly unhappy with me each time I won! So I thought I’d try to teach him some of the strategies that I was using. They might help your kids to play too so here they are. Every token you play should either potentially build your sequence or block your opponent from building theirs. If I have a choice between building or blocking, I will usually choose building. I try to build by playing tokens as close to each other on the board as I can – even if they are not right next to each other. I only worry about blocking my opponent if they have 4 in a row (you need 5 in a row to make a sequence) – Remember they may not have the 5th card in their hand anyway so having 4 in a row doesn’t mean they are about to win. When I hold my cards, I sort them into suits – hearts together, diamonds together, and so on – so that I can see easily the related cards. The Jacks are Wild so I put them together in my hand away from their suit. This makes them easy to see. Every card appears twice on the board so always find the two places that your card could go before you put it down. The corner spaces can be a part of your sequence without you putting a token there, so if you can build close to them, go for it. It is like getting an extra token for free! Look for how you could create two sequences that cross over and use the same token again – that’s one less token that you need to put down too. Always be checking that you don’t have any ‘dead’ cards in your hand – you can switch those out for a new card that could be helpful. Look for places where you might have created part of a sequence without realising it – like on the diagonal. Every time you pick up a fresh card, look for where it could go on the board and whether it is close to any cards you already have on the board or in your hand. Use a Wild card to finish a sequence – when you have 4 in a row and just need to fill the last spot the Wild card is perfect. I save my Wild cards for this. Sometimes I use the ‘anti-Wild card to remove a token that is stopping me finish a sequence. But only when I know I have a card I can put in that place on my next turn. Always remember: You might not get the card that you want so you have to work with the cards you have. There is still an element of chance in this game and sometimes you just don’t get the cards you need to win before your opponent. We've found a new favourite board game and Mr 8 needed some tips so here are my simple strategies for Sequence. This game looks great. Where did you get it from? It was a gift, Paige, but I’d check out the local toy sections – I’m sure I’ve seen it in Target or Kmart. Can you buy it on line? When you have multiple places to put a card and don’t need to block… look to control the center of the board. It gives you more possibilities for future cards and blocks the more versatile spaces for your use only. Placing at the edges of the board leaves you easier to block. On one side of the token is a small dimple. Us a black marker to ‘paint’ a dot there. While playing the game place your tokens with this marked side… down. When you make your row or sequence, flip those tokens over dot side up. This will make it easier to see the completed row.